A dental implant is an ideal tooth restoration for people who are missing one or more teeth as a result of injury, periodontal disease, or any other reason. 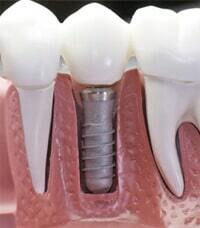 A dental implant is a titanium post that a periodontist or oral surgeon surgically positions into the jaw. Once in place and bone surrounding the implant has had time to heal, a replacement tooth is attached to the post. While implants are typically more expensive than other methods of tooth replacement, they provide superior benefits. Implants are stronger than natural teeth and generally last 10-20 years. They are also a more favorable approach than bridgework since they do not depend on neighboring teeth for support.